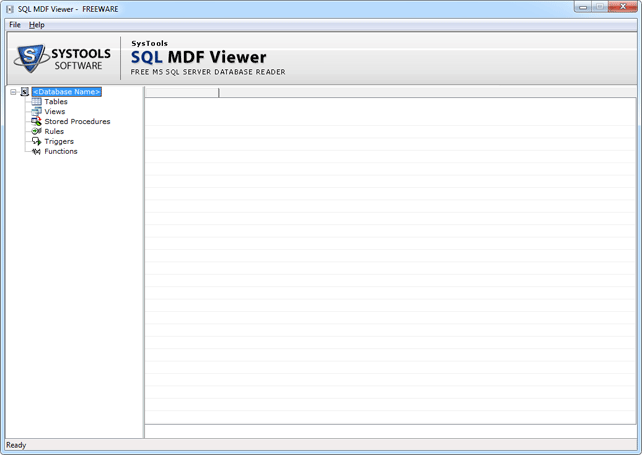 The SQL database viewer is compatible with all Windows version and run on all the versions of SQL Server including 2000, 2005, 2008, 2008r2, 2012, 2014, 2016 and helps user to view SQL MDF database easily. 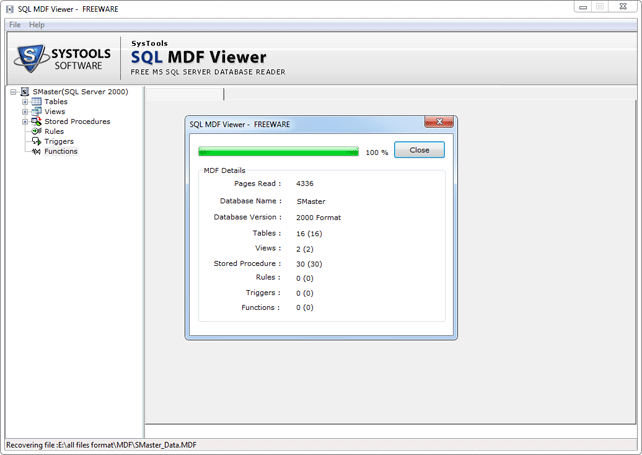 One of the finest solutions to view MDF file without SQL Server is now just a download option away from you, so go for the best opportunity to open SQL MDF file with ease and view SQL MDF file that include views, triggers, stored procedures, rules, functions, tables etc. absolutely free of cost. 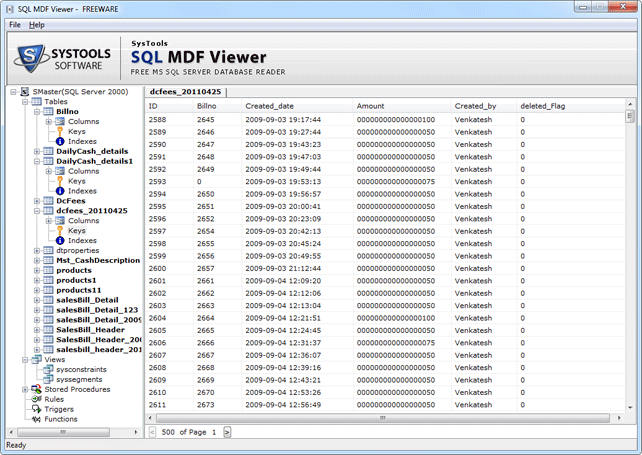 Enabled view to analyze data in the MDF files that are reported to be damaged in the SQL Server make the tool best SQL MDF database viewer available online. 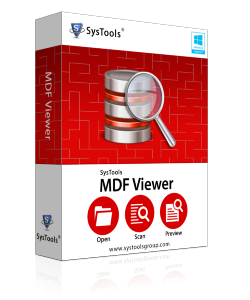 MDF viewer tool is capable to open and view both corrupted and healthy SQL Server MDF files, even when SQL Server environment is not available or active. When error message blocks the access of SQL MDF files, the first query will be how to view MDF file database? With the free SQL MDF file opener it is possible to view MDF file without SQL Server and one can analyze reasion behind the error message. To resolve the users query like how to open and read SQL MDF file, this tool is one affordable solution that carries advance algorithms at the back end. 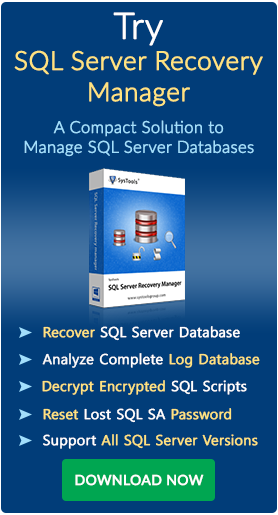 MS SQL MDF reader has added an advantage for user, which can help to open MDF database file and help user to assure the data that are stored in the SQL Server MDF file is available and can be recovered with MDF recovery tool that can be purchased for nominal price tag. With the help of free SQL MDF Viewer tool users can open MDF file of SQL Server and after getting the picture of database available in MDF, move for the purchase of SQL Software, that will help to corrupted and inaccessible MDF file to healthy format, it give freedom to resolve error message and corruption issues faced by SQL MDF file stored data. Which kind of elements I can open using this software? 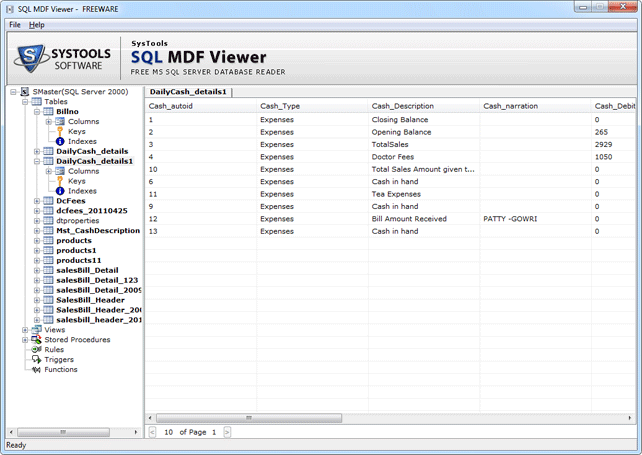 MDF file viewer utility can open and view SQL MDF database along with its elements like tables, triggers, stored procedures, user defined functions, views and user defined data type and much more. Is it necessary to install the tool to view MDF file? Yes, To open MDF database file it is necessary to download and install the tool, and with the tool user can open SQL MDF file thus analyzing the current status of database within the MDF file that are corrupted. Can I Open and view MDF file without SQL Server? Yes, SQL Server environment is not required to view and open MDF file. Can I check for my database in MDF files? 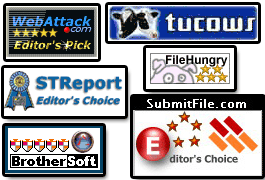 The software allows users to view availability of database in MDF files and cross check MDF corruption issues. Can I know the reason for the inaccessibility of MDF files using this tool ? Yes, free SQL MDF viewer software shows the reason for inaccessibility of MDF file and also verify whether corrupted MDF data can be recovered or not.